With all this cool digital marketing we're doing, you want to have a funky laptop bag to tote your laptop around in, right? Well, one of my favourite bag designers, Pinder Bags, is giving away one of their Giddy Up Laptop Totes. 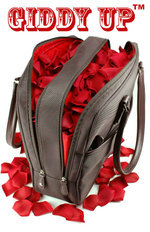 I reviewed the Giddy Up a few months ago over on my Funky, Chic and Cool Laptop Bag lens at Squidoo. To enter the contest, all you do is guess the number of rose petals the Giddy Up in the picture holds. You can get more deets including how to enter over on my lens.